A Wedge Salad is an elegant salad to serve that you can put together quickly, and easily. These are often served in fancy steak houses, and you can recreate this salad any night of the week with this easy recipe. 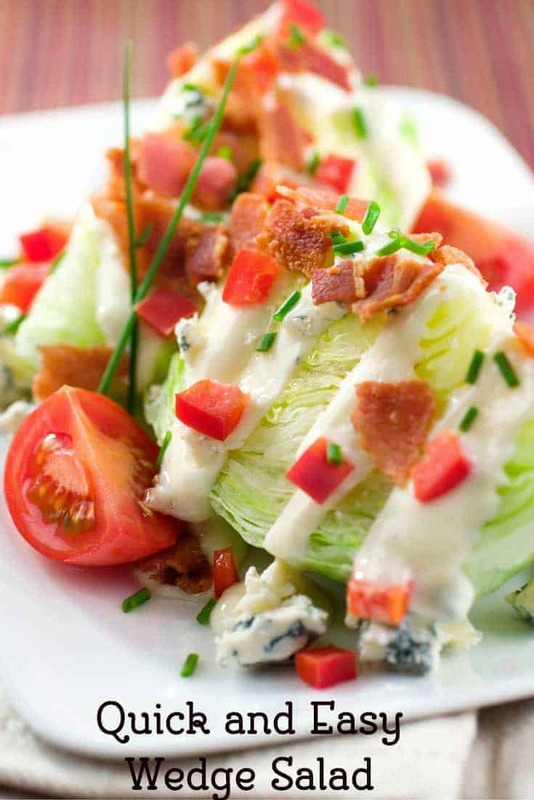 So often when you go to a nice restaurant or steakhouse you can order a wedge salad. These salads are so easy to make, they do look hard to make, but I promise, they are not difficult to make at all. In fact, you may be surprised how easy it is to make a Wedge Salad. I love these salads because you can put them together so quickly, and they look extra fancy for when you have guests. There are some variations in this salad made with Iceberg lettuce, but let’s go over the basics. For this recipe you will need iceberg lettuce, most grocery stores carry this type of lettuce, so this recipe doesn’t contain any exotic fancy types of lettuce that are hard to find. You will want to core the lettuce and then cut it into pieces. You are going to make full cuts in the lettuce, so be sure to cut all of the way through. You can serve a larger piece or a smaller piece, so adjust accordingly to the number of guests that you are going to serve. The salad dressing for this recipe is typically blue cheese salad dressing. You can also serve this with a ranch salad dressing. I have even done this with my copycat recipe for Houston’s Garlic Buttermilk salad dressing. You will want to cook up some crispy bacon, and chop tomatoes, and use some blue cheese for this recipe. There are some variations you can do to this salad, you could add some toasted croutons, or you could add some toasted nuts such as pine nuts, or almond slivers if you want to enjoy a little crunch to your salad. You could also add some fresh herbs to make this extra special. I have even added a balsamic reduction lightly drizzled over this salad for some nice flavor. You could also add some chopped red onions or chopped shallots. You get the idea the possibilities are endless. I hope you give the salad wedge a try at your next dinner party or family gathering. You will see it looks fancy, and it is so easy to make. Wedge salads are very easy to make. Remove core of lettuce, cut lettuce in 4 or 8 large slices. Drizzle salad dressing 1 or 2 tablespoons of salad dressing over each wedge, and add chopped crispy bacon and tomatoes. If desired you can add chopped red onions or chopped shallots, fresh herbs, or even croutons. I didn’t realize it was so easy to make this salad. I love any salad that is cut in small pieces. My favorite dressing is blue cheese. If I go to a restaurant they are very nice. And do this. It is better on my idigestive system. What is your favorite type of salad? I love a good Caesar Salad, but cannot seem to find a good recipe for the dressing. I like the creamy Caesar dressing at O’Charley’s Restaurant, but can’t find a CopyKat recipe for it. Have I overlooked it on your website possibly? I don’t have one from O’Charley’s. I will have to keep this in mind for a new recipe.